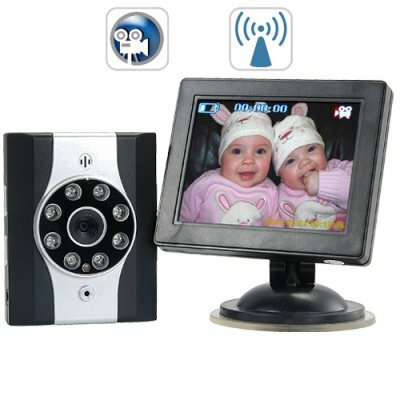 Successfully Added Wireless Car Baby Monitor with Night Vision + DVR to your Shopping Cart. Wireless Car Baby Monitor with Night Vision + DVR. Keep a safe eye on your infant while driving, day or night! As the parent of an infant, you want to keep an eye on your child at all times, even while driving. This natural instinct of monitoring our children is great, but when driving on the road this creates more harm than good. All it takes is a split second while looking back at your child, and the next thing you know you're in a rear-end collision. Fortunately, there’s a solution to this problem that affects parents and their children. The DV24 wireless car baby monitor. With this high quality baby monitor you can continuously monitor your baby's status without the need of turning your head or loosing sight of the road. Simply mount the baby monitor on your car's dash and place the camera facing your child. You can now keep your eyes on the road and only need to glace at the monitor when checking on your toddler. This is the safest, easiest, and most convenient way to make sure your child is safe while driving on the road. The DV24 has some great features that really make this brilliant product stand out. For starters, you get DVR functionality built directly into the camera. So you can record your child’s facial expressions and other spontaneous moments while you are driving. The video files are then stored onto a SD memory card for easy viewing and file transferring. In addition, the camera has built in infrared sensors so you can clearly monitor your child even at night time. If you have a child and drive a car then the DV24 is an invaluable investment that every parent should own. Purchase this item today and instantly reduce your stress while driving, and safely monitor your baby at the same time. If your friends or family have a child, then buy one for them as the perfect gift to show them you care. The DV24 Wireless Car Baby Monitor is in stock now and ready for next day shipment. This product is proudly presented to you by the leaders in wholesale electronics, Chinavasion! Safely monitor your baby while driving. Infrared capabilities for monitoring at night. Can use camera outside of car as a portable video camera. Built in DVR feature to record audio and video via SD card. This product will be shipped from separate warehouse by express courier or standard air mail according to your checkout choices; actual courier company may vary from main order products due to different warehouse origin. Please confirm with customer support if you received part of the order and are still waiting for the other. 1GB = approx 35 minutes of video. Easy installation with mounting hardware. Also great for law enforcement agencies, insurance investigators, truckers, and other professionals that do a lot of work from their car. Can I use the DV24 to record at night time? Yes, the DV24 has infrared capabilities to record at night time. What is the difference between this particular model (CVLL-DV24) and others I have seen on the market? This model is designed to be easily removed from its mounting stand and taken with you when you leave your car. That is a great feature to ensure the camera from theft, as well as making it available as an in-field video recorder. on 2011-10-16 05:01:00 Love it!!! We've had our in two years and it is fantastic. Have used this cam for 7-8mnd and we are very satisfied. We recomend this to everyone who have childre back in the car.